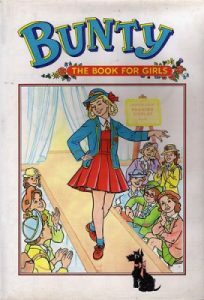 Bunty was a teen comic grabbed from shelves in the local newsagents between 1958 and 2001. Pages were full of fictional stories for youngsters aged 14 years old and under. 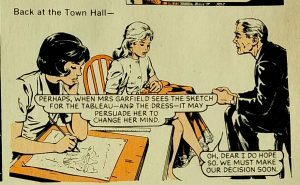 In the days before computers took over from pencil, pen and ink the comic strips were hand drawn. Girls and their friends, parents and teachers were seen in school, brushing horses, dancing, taking part in modelling competitions, getting into scrapes and solving mysteries. 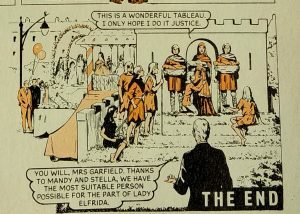 Bunty Annual 1962. Modelling at school. Flicking through the pages all the stories were good, clean, wholesome fun but the content was also a snapshot of young women’s lives and opportunities as they were in 1969. In the early 1960s the 11-Plus test existed which streamed children into state-run Grammar Schools or Secondary Moderns. Well-off parents could send their children to private schools or boarding schools as well. In 1969 the school leaving age was 15. Pupils were taught in classroom rows facing a teacher scratching lessons on blackboards before sending them off at the end of the day with homework. Qualifications before leaving were CSE’s – Certificate In Secondary Education or ‘O’ levels. Gaining skills for the workplace was important, something called technical education. Boys could learn woodwork and metalwork, skills for engineering and factories. Girls could learn, leave and start jobs with the skills required to be secretaries, factory machinists or seamstresses where sewing was key. 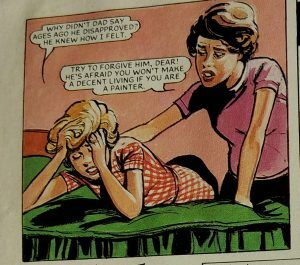 Pippa wanted to be an artist but her father didn’t approve of her going to art school. She was forced into learning dressmaking and typing subjects taught to girls in school. 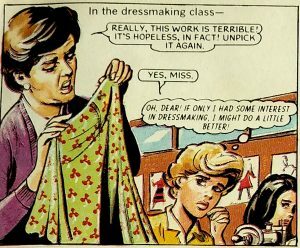 She was hopeless at both subjects, upset and distressed when the fearsome teacher told her the dress she made was rubbish, in front of her classmates as well! Her heart sank as she tapped on a typewriter knowing her heart lay in a different direction. Although her Mum was sympathetic she listened to her parents, particularly her father the voice of authority in her home. 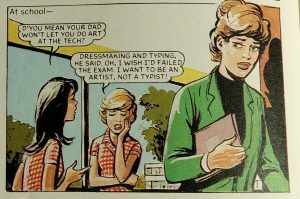 But as she railed against learning typing and sewing a teacher overheard her and encouraged her to paint. 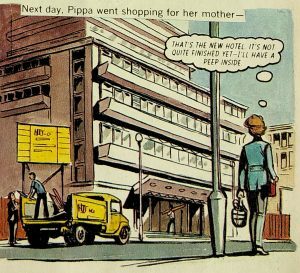 One day, out shopping for her mother she walked past a new hotel and walked in. A wall was bare, waiting to be painted and it gave Pippa an idea. Sketching an idea she presented it to the owners who loved it commissioning Pippa to finish the wall making a beautiful feature and a clear path to her future career. 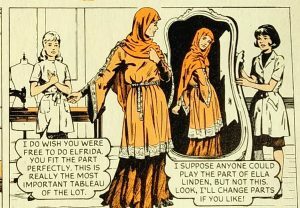 In the next strip two ladies left school with excellent sewing skills and set up an alterations and repair business – changing clothes to fit a customer’s specific measurements or mending ones that needed repair. 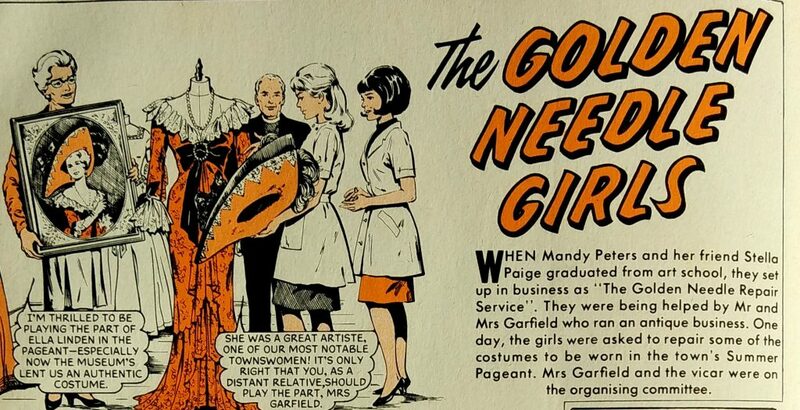 The Golden Needle Girls wore white coats to sew in, something seamstresses in Workrooms across the land had done since the 19th Century, keeping their clothes and the ones they were stitching sparkling clean. Asked to create costumes for their town pageant they immediately stepped in. 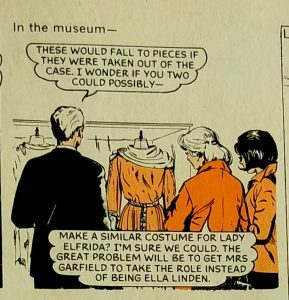 Theirs was a tough task – they had to persuade a reluctant actress that the part she wanted to play wasn’t as good as the one they were making the costume for. Theirs would be less glamorous but inspired by the local museum and better made. They sketched and worked knowing how to construct the costume from the first ideas right through to fitting. Cutting fabric and stitching it together, hanging it on mannequins and then taking it to the actress to pin and tuck and stitch again to fit her frame. They fitted it onto the actress who was reluctant but eventually saw the sense in playing a part with a costume so expertly made. In their hands the costume for the pageant turned heads and the actress made an entrance that the audience would never forget. In a BBC News report on 30th October Roger Kneebone professor of surgery said that medical students are spending so long in front of computers that they are losing the skills and manual dexterity to stitch up patients. Bring back more craft education, he suggested, it’ll teach them to use their hands. 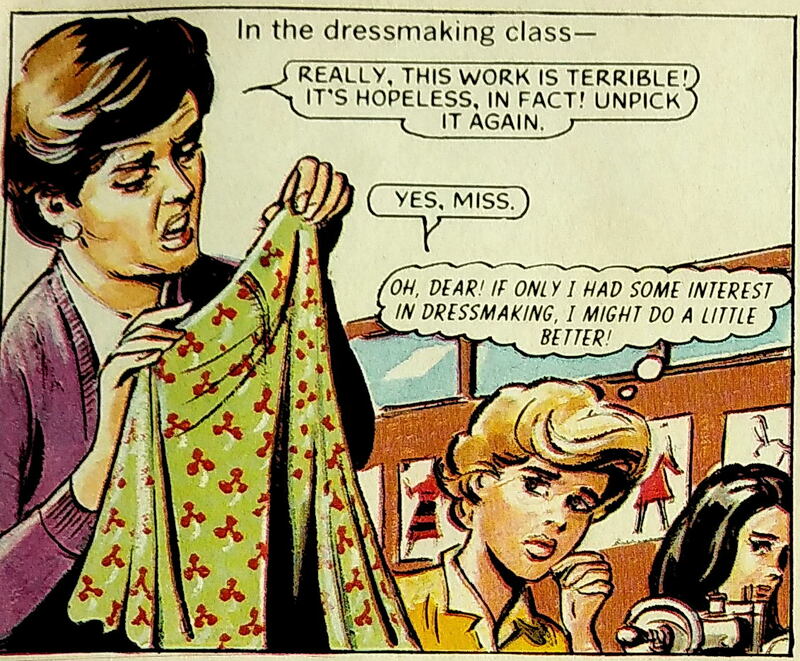 Dressmaking was removed from schools in the 1970s when the National Curriculum came in. Women’s working lives were changing and opportunities also rendering them out of date with the future workforce required in the UK. In talking about craft education Kneebone hit on a topic brought up by Patrick Grant, Great British Sewing Bee judge who said that sewing was ‘cooler’ since falling off the curriculum but while judging the competition suggested it was brought back in. There were many changes that affected girl’s lives in the 1960s but losing sewing skills from schools was one that altered the fabric of Britain. Perhaps its time to listen to Bunty comic and the experts and bring them back in.